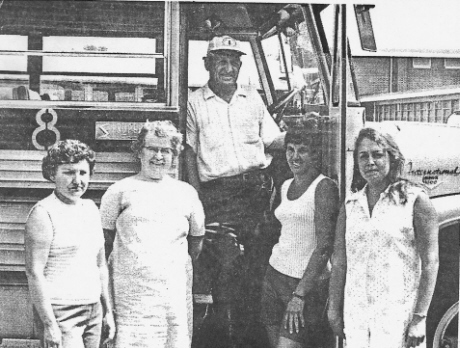 August 1969 photo of Evesham School bus drivers. Shown are Sonny Evans on step, to his left is Mrs. Evans and Marie Holtz. On Sonny's right is Barbra Brogden and Chris Ratzell. 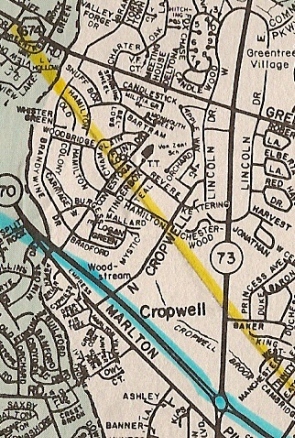 Circa 1910 photo showing Train Station and the Philadelphia, Marlton and Medford Railroad at Cropwell Road and present day Route 70, looking North from Old Marlton Pike. 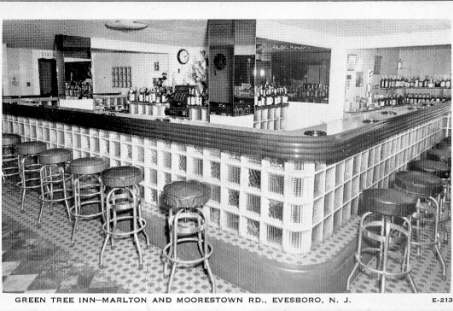 Photo from undated post card showing interior of Green Tree Inn, which was located at Greentree Road and Maple Avenue. June, 1967 view of Evesham Library shortly after its move to the Municipal Building at 125 E. Main Street. This was the Library's third location, first opening August 24, 1963 at the Marlton School on Maple Ave. About a year later the Library moved to 27 E. Main Street until the move to the Municipal Building. 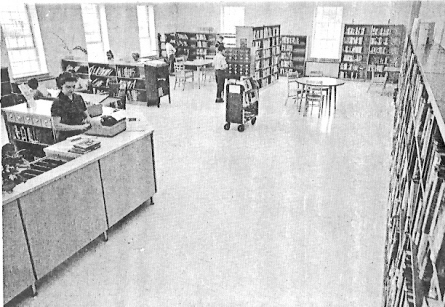 During the late 1970's the Library moved to space at the Tri-Town Plaza on E. Route 70 and remained there until 1998 when the current Municipal Building on Tuckerton road was completed and the Library occupied a large portion of the building. 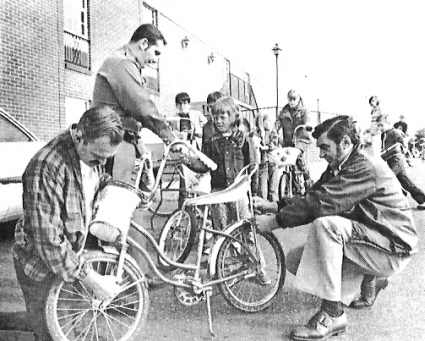 This 1972 photo shows Don Mc Dermott, Richard Halasak and Nick Rumbos (l-r) inspecting a bicycle at the Municipal Building as part of Evesham's bicycle inspection program. This program was conducted by Evesham Police with assistance from the Jaycees and VFW and held at various locations in the Township. For a small fee a bicycle would be checked for safety and registered with the police. This would involve stamping an ID number into the frame of the bike and affixing a reflective sticker with the ID number onto the bike. What is that yellow line bi-secting Woodstream on the map to the right? Doing some research recently, I discovered that this was the original planned route for the Marlton-Medford Railroad-right through the center of Woodstream. The road bed was actually constructed for this planned line in 1873. My source, a 1988 township publication, said there were still remains of the earthern mound of this bed from Woodstream to Locust Avenue. The blue line shows where the tracks were actualy laid in 1880.
are from collection of site creator, John S. Flack, Jr.